And it turns out I'm similarly susceptible to asanas of the more fanciful variety. Like take dragonfly pose. Maybe it's because it has the word “dragon” in its name (I know a dragonfly is not actually a mythical creature, but it kind of sounds like one, right? ), or maybe because it evokes a certain delightful nostalgia for the dragonfly barrettes and necklaces I funneled most of my eighth grade allowance into. Probably it's a little of both. In spite of my many initial challenges with it, it's always been one of my favorites. Because of the name, yes, but also because its shape and practice seem to conjure up a certain sense of playfulness and whimsy. But despite its delightful moniker, dragonfly (maksikanagasana in Sanskrit) can pose* quite the challenge. In fact, I first came across this asana in a Halloween class a few years back, and initially, I was sure it had to be the “trick” in some sort of yogic “trick or treat” metaphor. After all, this pose is an intense twist. And “hip-opener.” And arm balance. And you have to walk your foot all the way up toward your armpit. And keep it there. While you twist, and hip-open, and balance on your hands. All while breathing calmly and yogically, of course. But as it turns out, this pose is for real. And in spite of my many initial challenges with it, it's always been one of my favorites. Because of the name, yes, but also because its shape and practice seem to conjure up a certain sense of playfulness and whimsy for me. This is the part of the article where I should probably start listing pose benefits. And I suppose I could come up with a whole bunch of them. After all, dragonfly is a twist and thus comes with all of those cool twist benefits (No, it's not going to “wring out your organs,” but it will get you moving in a way that you might not generally be inclined to move, which can feel really good.) It also provides a pretty great lateral hip stretch and balance challenge, and as an arm balance, cultivates upper body strength and stability. But lots of poses can do that stuff. And when I really think about why I love and continue to practice this pose in particular, it's actually not that dissimilar from why I enjoy my unicorn cell phone case or my Marge Simpson lip gloss: Because it's fun. And it helps me take myself less seriously. And when it comes to asana practice in particular, sometimes that can be really hard. Often (and I'm betting I'm not alone in this) I'm awfully concerned about doing yoga poses “right,” knowing all of the “right” things about each asana, and even just being “yogic” enough in general. But when it comes to dragonfly—even though it's a fairly challenging pose, and even though there's tons of cool stuff to learn and subsequently yoga geek-out on about it—I can't help but feel a little extra lighthearted when I practice it. And while you're not going to find it in the Hatha Yoga Pradipika, maksikanagasana (for me anyway) is an embodied reminder to be open to all of the magical experiences that life, and yoga practice, have to offer. Remember, dragonfly is a twist. And a hip-opener. And an arm balance. So before you “hop to it” (note that this pose is also sometimes called “grasshopper”), be sure to warm up with a few of your favorite sun salutations (paying special attention to safe, healthy chaturanga alignment), standing poses, simpler twists (twisting lunges and chair poses, for example), lateral hip stretches (like figure-four and pigeon variations), and arm balances (a few pre-dragonfly side crows may prove especially useful). Often the biggest challenge when it comes to dragonfly pose is simply keeping your balance during the initial setup (which is usually a “figure-four chair pose”—chair balancing on one leg, with the opposite ankle crossed over the standing leg thigh—or similar position in a low squat). The variation below takes much of the balance part out of the equation, so you can really take your time focusing on the twist and working your foot high up onto your arm without having to worry about toppling over. Take two yoga blocks at their lowest heights and “stair-step stack” them on top of each other so that a little bit of the top of the bottom block is showing—enough space for you to rest your heel on (see picture below). Sit on the top block, and come into a seated “figure-four” position with your left ankle crossed over your right thigh, left foot flexed (your foot should be off of your thigh completely), and left shin straight across. Bring your right heel onto the exposed top of the bottom block; come onto the ball of your right foot, and keep your right toes on the floor. Sit tall; line up the back of your head with the back of your tailbone. As you inhale, breathe as though you could breathe right into your back and side ribs (you'll also likely notice some movement in your upper abdomen). Keep that three-dimensional sense of fullness as you exhale, and consciously engage your low belly, imagining that you could get even taller with the exhale. See if you can maintain that tone in your belly as you inhale, expanding your back and side ribs. Maintain that expansiveness as you exhale and re-establish the tone in your low belly. Enjoy a few more breath cycles like this. Then, on your next inhale, find even a little more length in your spine, and on an exhale, twist to the right, bringing your fingertips to the floor, and your left foot up onto your left arm. See if you can initiate the twist from the back of your left ribs, maintaining the “three dimensional” shape that you've been cultivating with your breath. Use your breath to continue working into the twist. With every inhale, back out of the twist a little as you establish the fullness in your back and side ribs and the length in your spine. With every exhale, see if you can find a little more twist. As you continue to work into the the pose, see if you can work your left foot up higher onto your left arm. When your exploration feels complete, on an inhale, untwist. Uncross your legs and repeat on the other side. Set up in the preparation above. Take your time working into the twist, and working your left foot high up onto your left arm. For this first variation, it's okay if your foot doesn't make it super-close to your armpit, but do make sure that your foot is above (not on) your elbow before moving on. From there, start to shift some of your weight forward into your hands, planting them on the floor as wide apart as they would be for chaturanga (wide enough so that the center of your wrist creases line up with your outer shoulders). 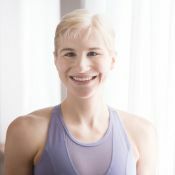 As you bend your elbows and shift forward into the arm balance, stay broad across your collarbones, and watch that your shoulders don't dip below your elbows, just like you would for chaturanga. Maintain your chaturanga-like arm position, and avoid resting your right hip on your right arm. From here, you can extend your right leg out to the left (flex your right foot). This leg position is a little more stable than the variations below because your right leg is pressing against your left outer ankle/foot, keeping it from sliding (that's why the foot doesn't have to be super-high up in this version). Either gaze slightly forward (keeping the back of your neck long), or you can turn your head to look at your toes. When you're ready to come out of the pose, bend your right knee, and lower your right foot, then your left foot to the floor. Rise to standing, and then set up for the other side. Think of the previous variation as a dragonfly just sort of chilling on a leaf or something. Think of this one as a dragonfly in flight. Set up for dragonfly as usual. Maintain chaturanga-like arms, and avoid leaning your right hip on your right arm (if that's not yet possible for you, continue to work with the previous variation for now). If you feel stable (you can breathe, maintain chaturanga arms, and your left foot isn't sliding down your arm too much), stretch your right leg straight back behind you (like you would for eka pada koundinyasana II or eka pada galavasana.) Keep your toes active! Either flex your right foot, or point your foot and spread your toes (a “flointed” foot). You might even find that this “toe power” helps you to balance in the pose. Keep your collarbones broad, your shoulders level with your elbows (not dipping forward), and all sides of your neck long. Gaze slightly forward. Stay for a few breaths, and when you're ready to come out of the pose, bend your back knee and bring your legs back to your starting position to exit the pose. Similar to flying dragonfly, having your foot high up your arm is super-important for this one. Use the same block configuration as you did for the previous variations. Really take your time working into the pose. The higher up your arm you can get your left foot, the easier it will be to wrap your right leg around your forearm. Once you shift forward into the arm balance, instead of extending your right leg out or back, slide your right foot forward between your hands. (Sliding the foot through can be deceptively challenging at first. If you start to get frustrated, or fall flat on your bum (quite common actually), remind yourself that this pose is called mating dragonfly. And one cannot possibly take one's self too terribly seriously when practicing a pose called mating dragonfly). If your foot does happen to make it through, wrap your shin around your right forearm. Enjoy a few breaths here. You may likely find that being in the pose is far less challenging than the process of getting into the pose. When you're ready to come out, slide your right foot back through your hands, plant your right foot, then your left foot, flat on the floor, rise to standing, and then repeat on the other side. *Pun intended. Pun always intended.